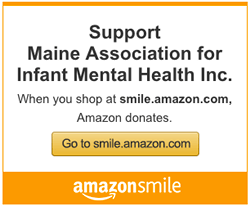 To become a member of the Maine Association for Infant Mental Health, which includes our quarterly Newsletter, “Everyday’s Child”, please use our online membership form and pay by Paypal, with your credit card, or mail us a check to the address listed below. All members get discounts on MeAIMH sponsored events including our yearly conference. Our membership year is January 1 through December 31. Dues and donations are both tax-deductible. Because member dues only partially offset expenses of the Association, donations in excess of dues are extremely valuable. MeAIMH is a 501c3 organization. Please use the Donate button in the right hand column of this page.